Installing a chain link gate on your fence is the perfect way to make your property more accessible—and it’s something you can do at home on your own. 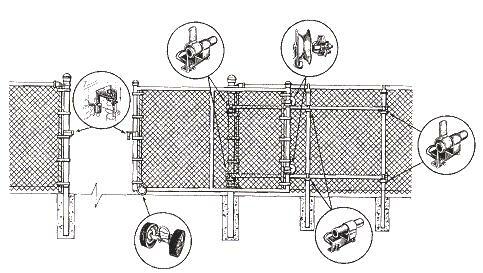 This how-to guide from America’s Fence Store will teach you the basics of chain link gate installation. Cantilever gates: Measure from inside to inside of the latch posts to the first gate or roller post. This would be the gate post closest to the opening. Then, measure from outside to outside of gate or roller gate posts. See illustration. Install the two bottom cantilever rollers so that the rollers are toward the inside of the fence while fabric is on the outside. The rollers should be approximately 1” off the ground. Place a piece of rail across the two rollers. Place a level on the rail and adjust the rollers up or down so that the rail is level. Also, make sure that the rollers are adjusted so that the gate will not slide into the grade as a result of a slope. Tighten the rollers. Install the two top cantilever rollers so the rollers will capture the gate once in place. Hand tighten the rollers. Install the gate onto the two bottom rollers. Stand the gate up. When in the upright position, slide the two rollers over and onto the gate. With the gate touching both bottom rollers (balanced in-between the rollers), tighten the two top rollers, leaving a ½” clearance between the rollers and top of gate frame (track or 2.5” pipe). Tighten the rollers. Roll the gate forward and backwards through the opening. If the gate binds, you may have to raise one of the top rollers. Adjust the rollers as needed so that you keep the gate as close to the ground as possible, but do not place the rollers below grade or buried. In the winter, the areas around the rollers will fill with snow and freeze. Do not dig a trench for the gate to fully open. Again, in the winter the snow will freeze the gate in place. Fully tighten all rollers upon completing final adjustments. Install the latch assembly. If installing a gate operator, use the large “V” receiver that allows the gate to be channeled into the receiver. If manually operating the gate, use a cantilever locking device so that a padlock may be applied. Make sure that you set your posts that will support your track on 8’ centers and used at least 2 ½” Sch 40 posts. A rolling gate uses two wheels installed on the back vertical support of the gate. These wheels run along track that is installed along the inside of the fence. Install your universal track brackets one foot from the bottom of the fence and one foot down from the top of the fence. The brackets are installed so that the U-bolt is below the track sleeve. You will need to install enough brackets to support as many 8’ lengths of track as required to bring your gate to the full opening, i.e. 20 opening will require three lengths of track (24’). Measure from bracket to bracket. Using 1 5/8” Sch 40 pipe, cut your track and install between the brackets. Be sure that your track is tight between the brackets so that we do not create a seam for the wheels to get caught-up. Once complete you should have a top and bottom track that is consistently the same distance apart from one end to the other. This is important to prevent the track from binding on the rear track wheels. Install your rear track wheels on the rear vertical support of the gate from. The wheels will be approximately one foot from the top and bottom of the gate. The wheels will be installed on the outside face of the gate so as to ride on top of the track. Hand tighten. Install the double wheel carrier as far forward as you can on the bottom horizontal member of the gate. Placing the gate in the opening with both rear track wheels on top of the track, adjust the rear track wheels so that both wheels bear down on the track. Make sure the lower guide on the wheels captures the track so that you cannot lift the gate off the track but the guide does not bind while traveling the track. Tighten the wheels. Roll the gate through the opening. Adjust the rear track wheels as necessary. The double wheel assembly has an axle trim bolt that allows you to control the direction of the gate as it rolls through the opening. Adjust as necessary. Using two end bands that fit around the latch post, install the offset lock n’ latch so that when the gate comes fully closed the tab on the latch is engaged, capturing the gate frame and allowing you to padlock the latch. You may have to adjust the double wheel assembly back on the frame so that the gate will engage the latch. Firmly secure all nut & bolt connections to avoid future movement.